Quickly and easily purify DNA from agarose gels with high yields. View our videos on protocols, tips, and recycling Monarch. Monarch columns are designed without a frit, which eliminates buffer retention and the risk of carryover contamination, providing fast, worry-free DNA purification. manipulations, library construction and DNA sequencing. 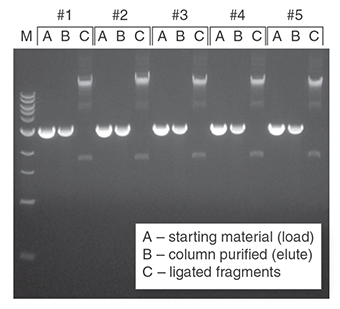 One microgram aliquots of a 3 kb fragment were resolved on a 1% w/v agarose gel, excised, and processed with different kits using manufacturer-specified minimum elution volumes. Values reported are the concentration and purity data determined by Nanodrop™ readings, as well as recovery calculations based on the eluted DNA concentration and recovered volume. Monarch DNA Gel Extraction Kit reproducibly recovers DNA over a broad range of molecular weights. A mixture of 7 DNA fragments ranging from 10 kb down to 0.5 kb was prepared and one-half of the mixture was resolved on a 1% gel. Each fragment was manually excised from the agarose gel and processed using the Monarch DNA Gel Extraction Kit. The entire elution of each fragment was resolved on a new gel with the remainder of the original mixture for comparison. 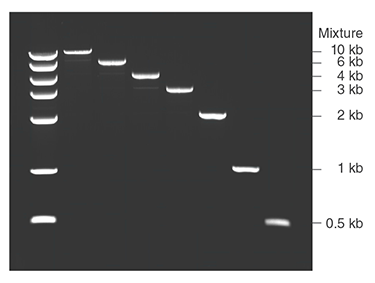 DNA purified from agarose gels using the Monarch DNA Gel Extraction Kit can be reproducibly isolated and ligated. Two micrograms of a 3 kb fragment with compatible ends was resolved on a 1% agarose gel, excised, and purified using the Monarch DNA Gel Extraction Kit. Samples were eluted in 20 μl and a fraction (1/4 th of total) was ligated using the Blunt/TA Ligase Master Mix (NEB #M0367). Representative samples from 5 replicates were resolved on a second 1% agarose gel. M is the 1 kb DNA Ladder (NEB #N3232). The kit should be stored at room temperature. Always keep buffer bottles tightly closed and keep columns sealed in the enclosed zip-lock bag. For information regarding the composition of buffers, please consult the Safety Data Sheets. Proper laboratory safety practices should be employed, including the use of lab coats, gloves and eye protection. 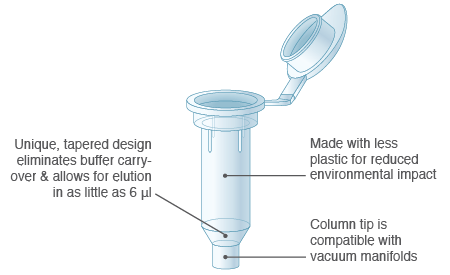 What is the smallest volume of elution buffer that can be used with the Monarch DNA Cleanup Column? What factors affect my (A260/A230)? Are the columns in the Monarch PCR & DNA Cleanup Kit (5 μg) the same as the ones in the Monarch DNA Gel Extraction Kit? What is the composition of each buffer provided with the Monarch DNA Gel Extraction Kit? Can I excise a fragment from a gel and store it for purification at a later time? 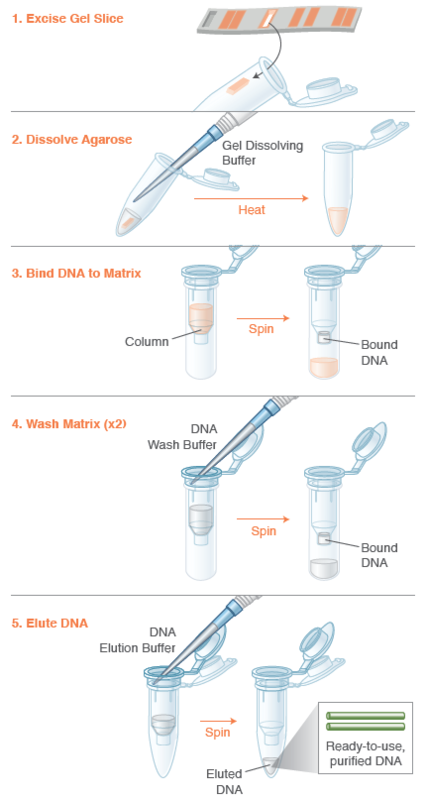 What size of DNA can be purified with the Monarch DNA Cleanup Columns? What type of agarose gels are compatible with the Monarch DNA Gel Extraction Kit? After purification, I see a faint additional band running below the expected size on a gel. What happened? Reagents added incorrectly. Check protocol to ensure correct buffer reconstitution, order of addition for buffers and proper handling of column flow-through and eluents. Gel slice not fully dissolved. Small clumps of agarose may clog the column or interfere with DNA binding. Be sure to incubate the gel slice in the Monarch Gel Dissolving Buffer for the specified time and within the proper temperature range. Mix the sample and inspect periodically to monitor dissolution of the agarose. Gel dissolved above 60°C. The DNA may become denatured if incubated at higher temperatures than the specified range of 37–55°C. Incomplete elution during prep. Ensure the DNA Elution Buffer is delivered directly to the center of the column so that the matrix is completely covered and elution is efficient. Larger elution volumes and longer incubation times can increase yield of DNA off the column at the cost of dilution of the sample and increased processing times. For typical fragments below 10 kb, the recommended elution volumes and incubation times should be sufficient, unless the maximal yield is desired. For the purification of larger fragments, heating the DNA Elution Buffer to 50°C prior to eluting and extending the incubation time after buffer addition to 5 minutes can improve yield. Additionally, multiple rounds of elution can be employed to increase the amount of DNA eluted, at the expense of dilution of the sample. Gel slice not fully dissolved. Undissolved agarose may leach salts into the eluted DNA. Be sure to incubate the gel slice and the Monarch Gel Dissolving Buffer mixture for the specified time and temperature. Mix the sample and inspect periodically to monitor dissolving of the agarose. Ethanol has been carried over. Ensure final wash spin time is 1 minute to ensure complete removal of the wash buffer from the column and be careful when transferring the column to a new tube for elution step to ensure column tip does not contact column flow-through. Trace amounts of salts that produce low OD260/230 ratios can also be carried over during the elution step. Be careful when transferring column to new tube for elution step to ensure the column tip does not contact column flow-through.